Love at first bite..: Taste of Italy.. I used to think westerners have no idea about cooking "real" (as good as Indian) vegetarian food... it's not like I have been to a lot of places around the world - but hey - let's face it - we are all prejudiced.. I must say I was wrong - big time - :-) glad to admit it - I simply loved the food in Italy - especially the vegetarian food. Just thinking about Italy takes me to a food utopia!! First stop - Trattoria Quattro Leoni in Florence - Trattoria in Italian means a casual diner. We started with Caprese Salad - Tomatoes, Fresh buffalo mozzarella, basil and olive oil. It is as simple as that - no fancy decorations needed - the food is fancy enough :-). It must be something about the Italian climate and the quality of soil or whatever - even a lame veggie like tomato tastes great.. every single ingredient has this beautiful natural flavor that makes even a simple combination like caprese salad taste heavenly! Highlight of the meal was this pasta... I cannot stop raving about it - Hand made pasta into a shape similar to a modak - it was stuffed with dried pear - yes the fruit pear - and served with white sauce - Simply Divine!!! We planned most of our trip as per Rick Steves guide book. I can write a whole post about how great and extremely usable the guidebook is.... I think for now it is sufficient to say that we were carrying and using it at all times during our trip. 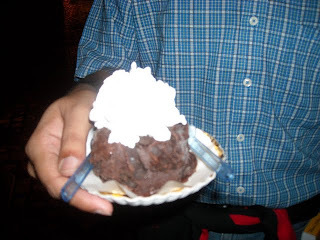 Rick highly recommended this dessert - Death by Chocolate at Tre Scalini cafe in Piazza Navona in Rome. It was described as the best in the world etc etc.. Shank being a chocolate fanatic - we hadta taste it.. so we did.. It was totally worth the hype! Multi-layered ball of chocolate - starting from outside - a thin layer of frozen chocolate fudge, followed by a thick layer of chocolate mouse, followed by a sticky chocolate mixture and a rum-soaked cherry at the center. and they serve it with whipped cream on top - what's not to like! Shank din't let me eat more than a few bites.. and said "I can do anything for love.. (but I won't do that)"
According to Rick Steves - and common sense - a restaurant filled with local people and lots of traffic usually guarantees great taste.... very true when it comes to this bakery. This bakery was 2 minutes from our hotel near Piazza San Giovanni in Rome. 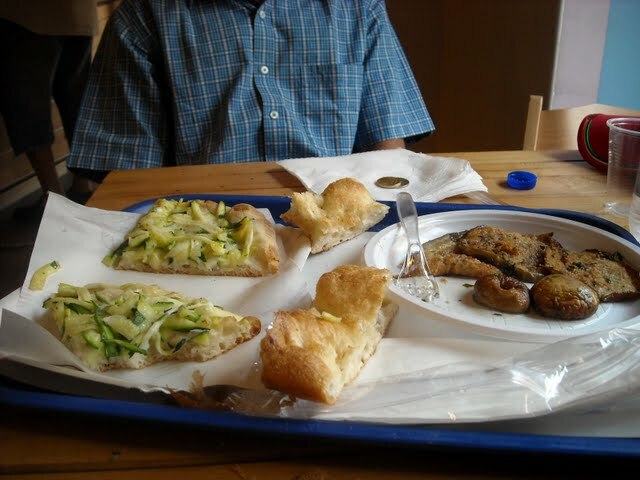 Their spread had a variety of grilled veggies, Pizza, cookies, bread and all of it was fresh out of the oven. They were running out of the Pizza so fast that every time I walked up to the counter there was a new steaming hot variety available! Here's a testimonial to this place and the in general to the taste of veggies in Italy - we had fresh zucchini pizza... the center picture below and it was as tasty as the tomato-spicy olive pizza! Of course we also hogged on the grilled mushrooms, eggplants and tomatoes and ended the affair with fresh baked cookies. When a menu in Italy says something is spicy - they mean it! We had a spicy (tikha/chamchameet) pasta in Di Gallo - right across from the Duomo in Florence. It was so spicy I called it Pav Bhaji pasta..
One of my colleagues who is Italian said to me that he does not "get" Indian food.... The reason is the use of spices - the flavors in Indian food are too complex - he said - Indian food will have saffron in rice, but then they will also add cloves and bay leaves and cardamom etc etc.. whereas a typical Italian sauce or pasta dish has one primary spice - at most two - and still it is delicious. I agree with him completely - the use of spices is very different in Indian food as compared to Italian. For example this pasta had tomatoes, olive oil, paprika and parsley - that's it. The quality of the ingredients takes care of the rest! 1. Gelato - Italian icecream. We had several gelatos over our 9 day trip and all of them were great! Especially on a hot summer day when you are taking long walks to sight see..
2. Cappuccino - Italians know how to make cappuccino. We had at least two everyday. Thoroughly refreshing! Imagine sitting in a roadside cafe in Piazza Navona looking at upcoming artists selling beautiful paintings and sipping away your cappuccino..
We ordered another cocktail just so we could get another bowl of olives.. oh - I wish I could go back to Cesar Augustus..
Have to mention Venice.... The Realto Bridge and surrounding Realto Market is full of small eateries. This was where we had first real Pizza - right out of the oven - full of flavors of fresh veggies just awesome! Popular spots in the evening are small crowded pubs that serve yummy finger food. You can also dine in one of the canal side restaurants - we did that - and the food was pretty good - but not the best in our trip. "If I weren't an Indian - I'd want to be an Italian"
Great narration and mouth-watering pictures. Keep up the good work!!! Thank you for this post. I went to Ristocampo and could not tell what she asked me after I ordered. I assumed she asked what I wanted "in mezzo," but I didn't know what I could choose... so I just said "tutto" and she rolled her eyes and just didn't put anything in it. :) sorry to hear that - I believe I just pointed at things and she put those in the sub. Very deliciously written :). Cant wait to go and try all the food you mentioned..